Philadelphia, PA (December 11, 2012) – High school students who are participants in the YMCA’s Black Achievers Program will learn firsthand about “green and sustainable” careers from members of Manko, Gold, Katcher & Fox, LLP, the environmental, energy and land use law firm based in Bala Cynwyd, PA. MGKF attorney Bridget Dorfman, the firm’s Director of Administration, John S. Kirk, and co-operative student intern Sean O’Donnell will present at this program taking place on Saturday, January 5, 2013 at Drexel’s LeBow Engineering Center for Automation Technology from 12:45 – 2 p.m. The YMCA Black Achievers program is an academic achievement/career development initiative purposed to help teens of color set and pursue high educational and career goals, resulting in graduation and acceptance to an institution of higher learning. At the YMCA Philadelphia & Vicinity, Y Achievers expands on this goal by providing developmentally based, extracurricular team mentorship and workshop activities, designed to give youth (grades 5-12) the tools they need to succeed in college and beyond. “Sustainability and community outreach have always been at the heart of our practice,” explained John Kirk. “It’s great to have an opportunity to talk with these students as they are beginning to focus on their futures.” The MGKF panel will address sustainability practices and various career opportunities in the many sustainability niches. Bridget Dorfman has been with the firm since 2004. She focuses her practice on regulatory compliance matters and real estate development transactions. She has written on stormwater regulation, asbestos, Leadership in Energy and Environmental Design ("LEED") certification, and the Uniform Environmental Covenants Act. In the community, she serves on the Board of Directors of the John Bartram Association. Kirk has worked in the legal industry for over 25 years, first in litigation support consulting, and later in law firm management and administration. He is a past president of the Philadelphia Chapter of the Association of Legal Administrators ("ALA"). Additionally, Kirk has been active with ALA in many other capacities and currently serves as Chair of ALA's Business Partner Relations Committee and on the Education Committee for the Greater Philadelphia Green Business Program. He was the recipient of the 2011 "Spirit of the ALA Award"—the highest honor of the association for his unique achievements. He is also a fellow in the College of Law Practice Management. O’Donnell has been with MGKF for the past few months as part of Drexel University’s Engineering intern program. His first Drexel co-op was spent with the Division of Aviation at Philadelphia International Airport. He is currently working towards his Masters in Environmental Engineering. Outside of school, Sean is a member of the Pennsylvania chapter of the Sierra Club. 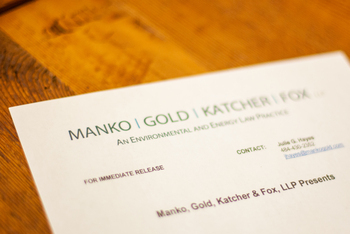 MGKF concentrates its practice in environmental, energy, and land use law and litigation. It represents clients ranging from Fortune 100 corporations to small, privately held enterprises, both in the Mid-Atlantic region and on a national basis. MGKF was honored to be the toprated law firm in the Top Workplaces 2012 and 2011 surveys by the Philadelphia Inquirer, Daily News and Philly.com. Offices are located at 401 City Avenue, Suite 500, Bala Cynwyd, Pennsylvania. 535 Route 38, Suite 145A, Cherry Hill, New Jersey, and now at 25 West Third Street, Suite 303, Williamsport, Pennsylvania. For additional information, visit www.mgkflaw.com or call 484-430-5700, 856-317-1299, or 570-567-7325.